Not to defend the idiots who pretend that cops are good people, but in their minds, the "criminals" (you know, drug users, gamblers, prostitution partakers, etc.) are SO scary that that to oppose any marauding that cops do would land them in a worse place than they are today. 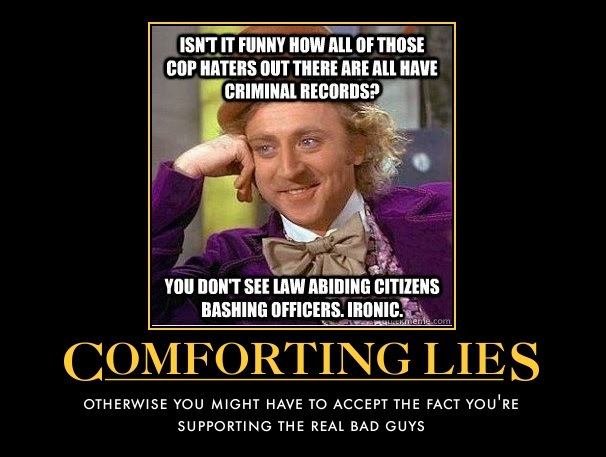 Complete nonsense, of course: the truth is that cops are largest, most deadly criminal gang in America. You are right, of course. It's just so bizarre to me that I have a hard time getting inside such a sick mind.